Source: Chess Monthly, January 1886, page 137. 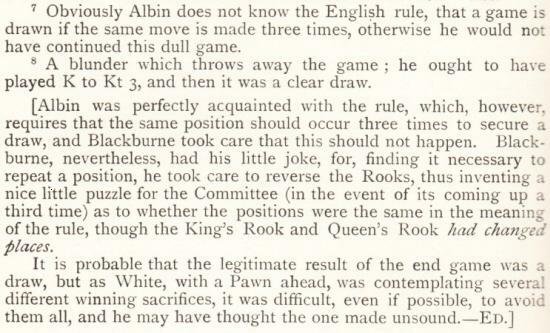 Jonathan Hinton (East Horsley, England) notes the provision became relevant in the sixth match-game, as discussed, for instance, by L. Pachman on pages 18-19 of Pachman’s Decisive Games (London, 1975). 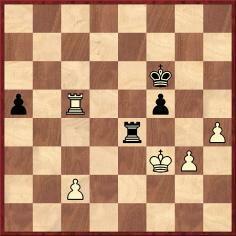 This is from Schlechter v Lasker, Game 1, Vienna, 1910. Play continued 56 Rxa5 Rc4 57 Ra6+ Ke5 58 Ra5+ Kf6 59 Ra6+ Ke5 60 Ra5+ Kf6. The position after Black’s 56th move was repeated at Black’s 58th and 60th moves, so under modern rules Black could have claimed a draw before playing 60...Kf6. 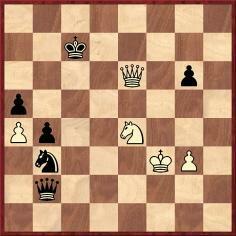 The second position occurred in Janowsky v Lasker, Game 8, Berlin, 1910. The game continued 49 Qd6+ Kb7 50 Qe7+ Kc6 51 Qd6+ Kb7 52 Qe7+ Kb6 53 Qd8+ Kb7 54 Qd7+ Kb6 55 Qe6+ Kc7 56 Qf7+ Kb8 57 Qf4+ Kb7 58 Qf7+ Kb8 59 Qf8+ Kc7 60 Qf4+ Kc6 61 Qd6+ Kb7. The positions after 49...Kb7, 51...Kb7 and 61...Kb7 are identical, so again Black could have claimed a draw (at this point a draw claim would have been perfectly reasonable even though Black actually won the game). As I understand it, at one time the repetition rule required that the moves had to be repeated, rather than the positions. Thus in the first example the moves leading to the positions were not the same, being ...Rc4 in one case and ...Kf6 in the other two cases. The second specimen is a little different, in that the move preceding the repeated positions was in every case ...Kb7, but the king came from c6 twice and from c7 once. My main question is whether anyone knows the exact rule which was in force at the time and, in particular, what was the rule for these world championship matches. I would also be interested to know when the modern form of the rule was introduced. Regarding the code of laws set out in the Handbuch des Schachspiels in the latter part of the nineteenth century, courtesy of the Cleveland Public Library we give a PDF file comprising the relevant text from the sixth and seventh editions of the Handbuch, published in Leipzig, 1880 and Leipzig, 1891 (pages 15-17 and 26-27 respectively). Source: Brooklyn Chess Chronicle, 1 November 1882, page 17. 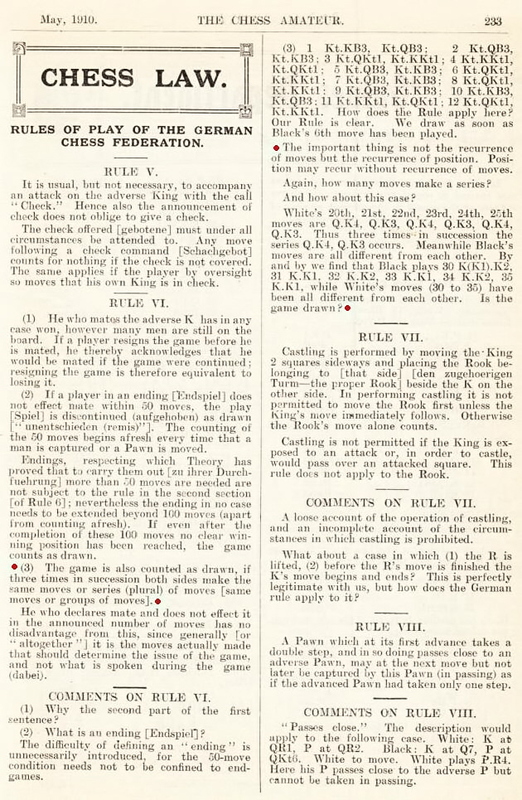 The Rules were reproduced on pages 37-38 of the Brooklyn Chess Chronicle, 15 December 1883. Latest update: 11 November 2016.